It’s going to take a while to unpack last night’s Board of Ed. meeting which didn’t end until well past midnight. A letter from a parent to the BOE, a ten year old’s compelling and heartfelt comments at the meeting, a short animated film about what testing can feel like for a child, and an article written by a teacher in Chicago that includes many points that hit home here in Montclair, NJ. I was a regular at Board meetings in spring 2013 through the end of February 2014. Since then, I have not been able to attend. As I’m unable to be there yet again tonight, I’m writing to express my support for the resolution scheduled for your vote this evening. would not be punitive and will not include “sit and stare” policies. 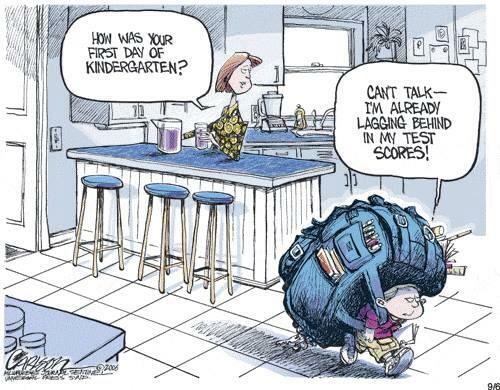 increased stress, and confusion for parents, children, and teachers. and too wordy and confusing. There’s barely time for art, music, social studies, science, library, and Spanish. Our children need a much more engaging learning experience. They need to play, experiment, and explore with hands on, project- based learning. for appears to be disappearing. Authentic teaching and learning cannot be achieved by high stakes testing, PARCC prep, mini PARCCS, tests to practice for the PARCC or endless worksheets. The joy has been gone from our schools now for almost two full years. test directions, filling in the bubbles–instead of blowing them. 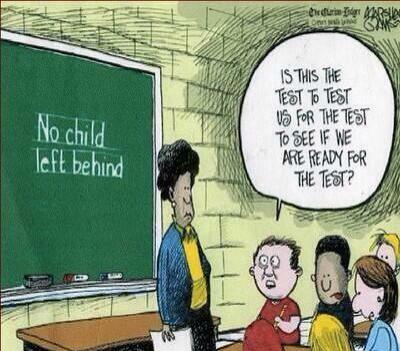 changes, by high stakes testing, by standardization, by “rigor”, “college and career ready” data driven reforms. I see the mind numbing worksheets. Wasting our children’s brains and imaginations on useless, stressful, busy work; lessons that serve Pearson, perhaps, but not our children. instead of the race to nowhere and the many children being left behind plan that is currently in place. Why is it we can’t we have our children run the BOE? A very smart and brave 10 year old student, Elizabeth Blaine spoke up against the PARCC at the BOE meeting. Once again, we heard many teachers speak out at the BOE meeting. Visit Montclair Education Matters blog for more local teacher voices. Katie Osgood, who teaches in Chicago, describes what the Common Core and PARCC have done to her classroom. Whatever the children read is decontextualized, lifeless, bare of interest, skill-based. They are engaged in “close reading,” following David Coleman’s ideology. My school is drowning under the ridiculous Common Core Standards. Everything I know to do to inspire my students is forbidden. Instead, we are forced to deliver truly horrible curriculum in developmentally inappropriate ways with pacing charts that move so fast all our heads are spinning. My students with special needs are shutting down, acting out, or just giving up entirely. Sometimes I hear them whisper, “I hate school”. And they are right to think that. All the teachers are upset. And every time we ask “Why? Why are you making us do this?” the answer is always the same. 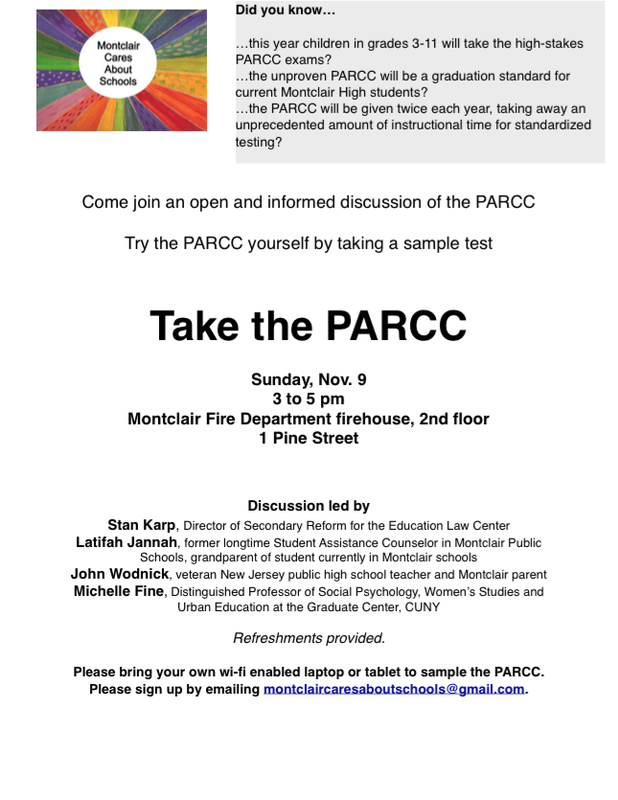 PARCC is coming…. Happy Chanuka to all celebrating!